Reviewed as “gorgeous” (Washington Post) and “stunning” (Lawrence Journal-World), the music of Timothy C. Takach has risen fast in the concert world. Applauded for his melodic lines and rich, intriguing harmonies, Takach has received commissions from various organizations including the the St. Paul Chamber Orchestra, St. Olaf Band, Cantus, Pavia Winds, Lorelei Ensemble, VocalEssence, the DeBartolo Performing Arts Center, The Rose Ensemble, and numerous high school and university choirs. His compositions have been performed on A Prairie Home Companion, The Boston Pops holiday tour, multiple All-State and festival programs and at venues such as the Library of Congress, Kennedy Center and Royal Opera House Muscat. 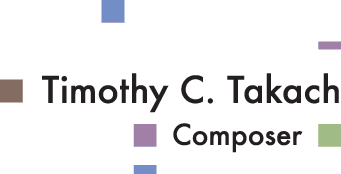 Takach has received grants from the American Composers Forum, Meet the Composer, Minnesota State Arts Board, Metropolitan Regional Arts Council, and ASCAP. He is a co-creator of the theatrical production of All is Calm: the Christmas Truce of 1914, by Peter Rothstein. The critically adored show has had over 100 performances since its premiere in 2006. He was also selected for the 2014 Nautilus Music-Theater Composer-Librettist Studio. Takach has frequent work as a composer-in-residence, presenter, conductor, clinician and lecturer for conventions, schools and organizations across the country. He is a full-time composer and lives in Minneapolis with his wife and two sons. Reviewed as “gorgeous” (Washington Post) and “stunning” (Lawrence Journal-World), the music of Timothy C. Takach has risen fast in the concert world. Applauded for his melodic lines and rich, intriguing harmonies, Takach has received commissions from the St. Paul Chamber Orchestra, St. Olaf Band, Cantus, Pavia Winds, Lorelei Ensemble, VocalEssence, the DeBartolo Performing Arts Center, The Rose Ensemble, and numerous other organizations. His compositions have been performed on A Prairie Home Companion, The Boston Pops holiday tour, multiple All-State and festival programs and at venues such as the Library of Congress, Kennedy Center and Royal Opera House Muscat. He is a co-creator of the theatrical production of All is Calm: the Christmas Truce of 1914, by Peter Rothstein. Takach studied music composition at St. Olaf College, Northfield, MN, where he graduated with honors. He has frequent national work as a composer-in-residence, presenter, conductor, clinician and lecturer. He is a full-time composer and lives in Minneapolis with his wife and two sons. Reviewed as “gorgeous” (Washington Post) and “stunning” (Lawrence Journal-World), the music of Timothy C. Takach has risen fast in the concert world. Applauded for his melodic lines and rich, intriguing harmonies, his compositions have been performed on A Prairie Home Companion, The Boston Pops holiday tour, multiple All-State and festival programs and at venues including the Library of Congress, Kennedy Center and Royal Opera House Muscat. He is a co-creator of the theatrical production of All is Calm: the Christmas Truce of 1914. Takach has frequent national work as a composer-in-residence, presenter, conductor, clinician and lecturer.